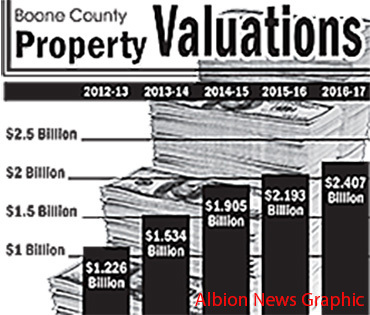 Boone County’s total assessed valuation increased about 9.7 percent to $2,407,095,340 for 2016-17, according to figures announced last week by County Assessor Barb Hanson. The valuation increase was the lowest of the past five years. It includes a total real estate value of $2,283,132,929 and total personal property value of $123,962,411. The increase was $213,149,827, or 9.71 percent, down from last year’s 15.1 percent increase. Higher agricultural land prices were still reflected in the three-year average of sales used for assessment, but the rate of increase has slowed. A big factor in valuation this year is retirement of the tax increment financing debt used to finance the Albion ethanol plant. 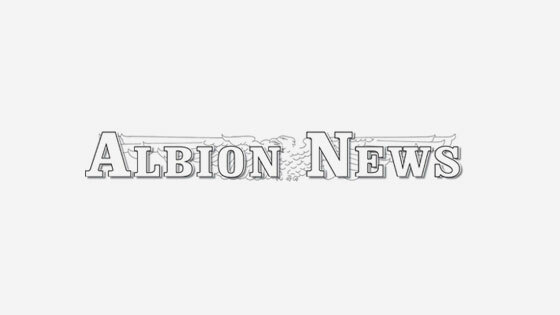 The property goes back on the tax rolls, which adds more than $39 million to the overall valuation of the county, and also boosts valuations for the City of Albion and Boone Central School District. 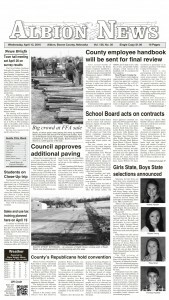 Albion’s city valuation grew by more than $47 million or 50.58 percent. However, the TIF retirement will result in a “trade-off” of revenue sources for the city, said Andrew Devine, city administrator. Under the redevelopment agreement at the time the plant was built, the city has received electric franchise fees totaling about $125,000 per year from Cornhusker Public Power District based on three percent of gross revenue from power used by the ethanol plant. Those franchise fees will end with retirement of TIF, and that portion of revenue will now come from property tax. Valuations of all Boone County governmental subdivisions in the Aug. 24 Albion News and Petersburg Press/Print and E-Editions.